Written by Matt on 19th Oct 2016. Don’t be discouraged by the cost of building your own greenhouse, as greenhouse gardening is really the newest innovative way to garden. You need to weigh up the gains from greenhouse gardening against the cost you will incur from building it. After reading this article, it will become obvious that the benefits of greenhouse gardening far outweigh the costs. Written by Matt on 19th Jul 2016. Knowing how to regulate the temperature and keep it from rising to levels that could potentially kill your plants is essential if you’re to have a consistent, healthy crop and while in Britain moderating winter temperatures is more difficult, maintaining productive temperatures during the summer can be just as important. Written by Matt on 18th May 2016. Growing your own produce in a greenhouse is an incredibly fulfilling and enjoyable pass time, but as with any hobby that requires a degree of skill and knowledge, the learning curve can be quite steep. Even when growing the hardiest of plant species, there is a large number of variables that can affect growth rates and the success of a yield. Written by Matt on 11th Feb 2016. If you like growing flowering plants for decorative use as well as edible crops in your greenhouse, the petunia is an excellent choice to plant at this time of year. Unlike some other plants you can grow from March, petunia plants do not need an additional heat source in early spring, and will grow comfortably in the shelter of your greenhouse. Written by Matt on 2nd Feb 2016. Those who are new to greenhouse gardening often think that glasshouses are best suited to growing flowers, herbs, and perhaps cool season crops like leafy green vegetables. The common belief among novices is that “picky” summer vegetables like tomatoes and peppers can be started in a greenhouse in late winter or early spring, but must be moved outdoors once the weather warms up. Written by Matt on 22nd Jan 2016. Most garden pests die off over winter because it is cold and they can’t survive in freezing temperatures, but in the relatively comfortable environment of a greenhouse, any remaining pests will thrive. Slugs, aphids, red spider mite and mealy bugs all like to hibernate in hidden places inside a greenhouse. If you don’t eradicate them before spring, your newly sown seedlings will provide a tasty banquet for them to feast on. A deep clean will help you locate any sneaky slugs and other pests before they cause havoc when you start sowing seeds. Written by Matt on 16th Dec 2015. 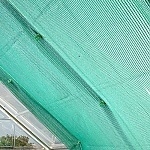 Greenhouses provide a warm, safe environment for gardeners to grow their precious plants and tender seedlings, but they are not always very environmentally friendly. But don’t worry because there are lots of ways you can make your greenhouse greener. Written by Matt on 11th Dec 2015. Written by Matt on 30th Nov 2015. It's pretty obvious that the larger the greenhouse, the higher the cost of heating it but it is possible to curtain off a section of the house in the winter with bubble-wrap and reduce the volume that has to be heated. Written by Matt on 10th Nov 2015. Greenhouse gardening is the best way to undertake winter gardening because it allows you to enjoy your hobby when it's freezing cold outside. Of course, if you want to see success here, there are some things you will need to do. Keep reading to find out more. The first thing to decide is how much of your greenhouse you want to keep warm and so need to insulate. Usually a greenhouse starts to fill when the weather is warming in spring and in the cold of winter it's probably just overwintering some tender perennials and getting an early start on some seedlings so not needing all the available space. Usually though, those buying their first greenhouse won't realise how immensely useful they are until they have gone through a season. My first greenhouse was a 6x8, six feet wide and eight long. That first summer I found myself trying to cram in 5 varieties of tomato, 3 types chilli peppers, 3 types of sweet pepper, cucumbers, aubergines and hanging baskets being brought on for the summer. Greenhouses serve to both extend the growing season and to provide better growing conditions during the season, enabling us grow tender crops such as tomatoes and aubergines even in a bad summer. In a good summer though the greenhouse can become a very hostile climate to grow in. It's surprising how quickly the temperature can soar to levels that kill our plants as surely as if they were put in the oven. That same sunlight that powers photosynthesis and growth can turn to scorching, killing the leaves. Written by John Harrison on 7th May 2015. To be honest, cleaning the greenhouse on a cold winter's day is not the most pleasant of tasks but it has to be done. Over the year the glass gets dirty and possibly has algae growing on it which will reduce the light that gets through by as much as 10%. The other reason to thoroughly clean the house is to kill off the pests and problems that are overwintering inside, sheltered from the elements.